Conceptually, in the approach to and resolving problems that arise in a non-mobilized status, Air National Guard commanders should understand that while there are many similarities between themselves and active duty commanders, there are also many differences. The differences stem inherently from the state and federal responsibilities of the ANG which require adherence to the laws of and control by two sovereigns. 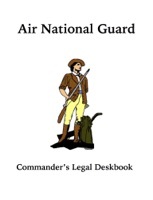 As a result, there are Air Force instructions that are not applicable to the Air National Guard, Air National Guard instructions that are not applicable to the active duty Air Force, and state laws that are only applicable to the Air National Guard of that state. It is this basic difference ANG commanders must keep in mind as they lead and manage their people to accomplish their missions and responsibilities.